We all know that the weather in Chicago has been unpredictable, unseasonal and, at times, deadly. We have had storms that destroy. In Evanston at Cahn Auditorium the cast and crew of the current Rodgers and Hammerstein classic “South Pacific” they have created their own storm – and it is a perfect storm. Light Opera Works first presented this magnificent R&H show in 2006 with Larry Adams starring as Emile de Becque and he was fine as was the entire production. In revisiting this show 9 years later LOW made the wise choice to bring him back. The only difference 9 years later is that he has ripened and is at that perfect time to fully realize this role. To say he is magnificent would be an understatement. “South Pacific”, penned by Richard Rodgers and Oscar Hammerstein and premiered on Broadway in 1949 became an instant hit. The story is based on several stories taken from James Michner’s Tales of the South Pacific and consists of only three of them, tightly woven together as a vehicle for Mary Martin and the theme of prejudice that was so important to Rogers and Hammerstein. The plot centers on an American nurse stationed on a South Pacific island during World War II who falls in love with a middle-aged expatriate French plantation owner but struggles to accept his mixed-race children. A secondary romance, between a U.S. lieutenant and a young Tonkinese woman, explores his fears of the social consequences should he marry his Asian sweetheart. 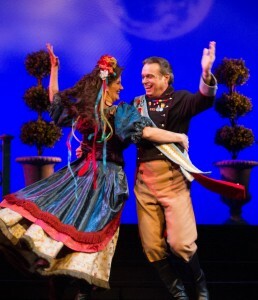 The issue of racial prejudice is candidly explored throughout the musical. Rudy Hogenmiller’s production is almost flawless in concept and realization. 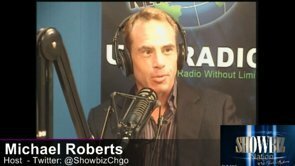 In fact it is among the best of his work over an extensive career. What makes it such? It mostly is in the casting choices. And this is one of the strongest he has assembled. With Larry Adams (Emile de Becque) and Sarah Larson (Nellie Forbush) as the central force of the production he has surrounded them with actors, dancers and singers who intensely radiate from their light. Adams and Larson possess the kind of legendary chemistry of Bogart and Bacall, Tracy and Hepburn and Alfred Lunt and Lynne Fontaine. Larson’s Nellie Forbush is the closest I have seen to capturing the elusive quality Martin injected into the role in 1949, bringing an effervescence and genuine naiveté to the role that other actresses has only put on; Sarah Larson exudes this naturally and fully inhabits the role. Others strong performances are Justin Adair’s Lt. Joe Cable (with a voice to match his innate stellar acting ability), Victoria M. Ng’s Liat (for once I believe this was played by a fourteen year old) and Yvonne Strumecki’s Bloody Mary (she is also revising her 2006 Light Opera Works role in the show). Strumecki, like Adams, has ripened into the role and is the solid anchor at the shows center core (she also performed in the stunning second nation tour based on the revival at Lincoln Center, so she knows this role inside and out). Hogenmiller has also assembled one of the strongest chorus’ I have seen in his work. From the moment the curtain rises you feel a magic electricity in the air, assuring you this is going to be one of those special productions that will forever remain etched in your psyche. Much of the audience was in tears at the final curtain which is a testament to the LOW company that they have knocked the ball out of the park. I also feel that this is the most mature of Hogenmiller’s work; he fully understands this show and has the finely honed skills to bring it out in the cast. Roger L. Bingaman’s musical direction is simply superb. When this 30 piece, union orchestra swells with the glorious score it is quite literally a soul-stirring experience. Seeing much of Bingaman’s work I can’t help feeling that he is at the zenith of a long, illustrious career and Light Opera Works is fortunate to have him at the musical helm. In the area of design Adam Veness’ set (reminiscent of the 1949 original production) is stunning and reflects a maturity and craft that permeates this entire company and production. His design transports you to the South Pacific of 1949 and has touches of the famous Technicolor of the hit film (not possible without the gorgeous lighting design of Andrew H. Meyers which brings Veness’ set to life and alters its mood). Aaron Quick’s stellar sound design gave the illusion that planes were not only flying overhead but side to side. Catherine Young’s and Sydney Dufka’s costume design is for the most part spot-on. I wish the formals could have been richer in fabric and texture, however they capture the spirit of the original. As this production only runs 8 more performances (a travesty!) this is a MUST-SEE for anyone who wants to feel the heart thump with the life and death struggle for romance and freedom in this seldom-performed masterpiece of the American musical. You can save the cost of airfare to fly to New York when you have Light Opera Works’ Broadway quality production in your own back yard. This is another jewel in their crown. 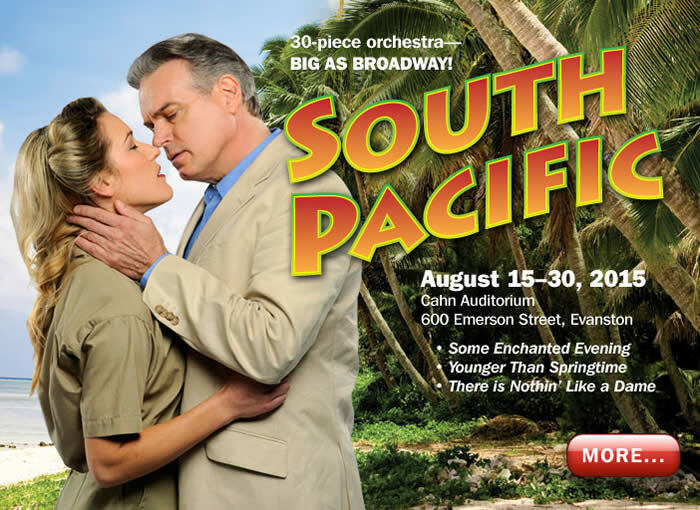 South Pacific plays at Cahn Auditorium through Sunday, August 30th. Call box office at Light Opera Works for tickets or visit light-opera-works.org. Tickets begin at $34.00. 847-920-5360.